The ancestors of modern humans interbred with other early hominids, including Neanderthals. Early modern humans likely encountered Neanderthals and Denisovans after migrating from Africa approximately 50,000 years ago. To the trained interpreter, the human genome is a record of the human past. Ancient environments leave their imprint through natural selection; meanwhile, patterns of genetic similarity among different individuals hint at aspects of their shared history, ranging from family relationships to mass migrations that happened thousands of years ago. The past that has come to light is more complex than researchers had suspected. 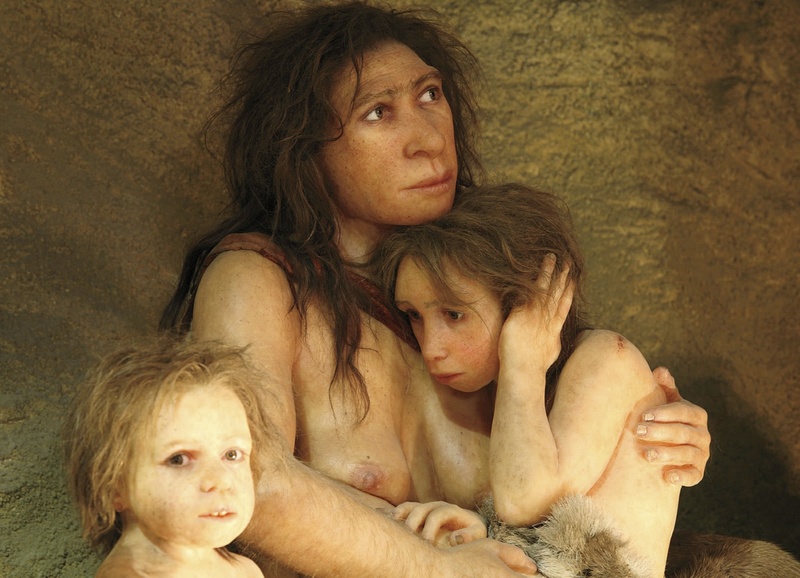 In 2010, as part of the effort to sequence the Neanderthal genome, Reich and colleagues came to a surprising conclusion: sometime in the distant past, not long after moving out of Africa, modern humans interbred with Neanderthals. In fact, pieces of Neanderthal DNA live on today, in people of European and East Asian heritage. In Europeans and East Asians, these pieces summed to an average of about 2 percent of the genome. But the areas of Neanderthal ancestry were not randomly distributed; in some regions of the genome, in fact, nearly two-thirds of Eurasians showed Neanderthal descent. Natural selection seems to have favored the associated genes, which disproportionately affect skin and hair, and Reich’s team hypothesize that they helped modern humans adapt to their new, non-African environments. Other details about the interbreeding have surfaced as well. Nothing in the archaeological record so far suggests when or where humans and Neanderthals met, but using genetic evidence, Reich estimates that their last encounters occurred 47,000 to 65,000 years ago. Likewise, he and colleagues found that humans today are most closely related to a Neanderthal individual whose remains were found in the Caucasus Mountains, even though Neanderthals were known to have lived primarily in Europe. Nevertheless, many aspects of the interbreeding remain in the dark. “We don’t really know how many matings there were,” says Reich. “We don’t know if it was Neanderthal males and modern human females, or the reverse, or equal numbers of both.” Nor is it clear why the interbreeding occurred—whether it was consensual, or influenced by factors like warfare or a need for mates at a time when modern humans were likely outnumbered. More broadly, Reich has found that species boundaries among early hominid groups were by no means fixed boundaries. 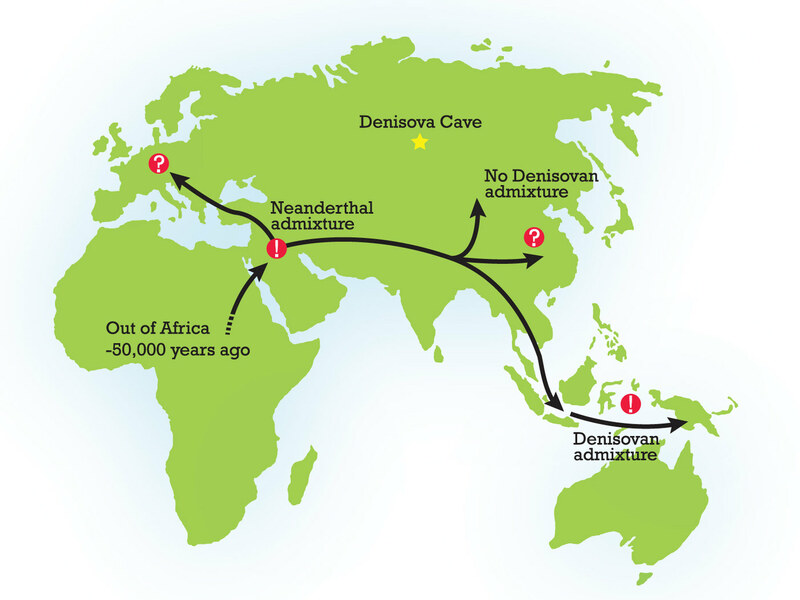 In 2010, the genome sequencing of an ancient finger bone from a Siberian cave identified an entirely new hominid group, distinct from both humans and Neanderthals, which Reich and collaborators named the Denisovans. The Denisovans, too, once interbred with the forebears of modern humans—Polynesians and Aboriginal Australians show evidence of Denisovan ancestry—and Reich’s team now suspects that Neanderthals interbred with Denisovans as well. More genome sequences, both ancient and modern, are needed to understand all the hypothesized admixtures, but the familiar human evolutionary tree already seems more tangled than previously thought.